Save time searching online with this guide for all natural hair care brands. All brand owners source ingredients that have not been tested on animals. Treat your hair naturally with HALKA B. Organics all natural hair treatment oils for dark and fair coloured hair. Living Libations Scalp Tonic is a botanical hair treatment to help nourish the scalp and hair. Clean your hair and scalp with Living Libations all natural Seabuckthorn Hair Shampoo and Shine On Conditioner as well as Living Nature’s Certified Natural Balancing Shampoo and Conditioner. Both do a wonderful job of cleaning the hair and scalp. Rahua, founded in the US by celebrated stylist and colourist Fabian Lliquin, is a distinctive elegant hair care range created with 100% natural and certified organic ingredients which have been sourced from the Amazon rainforest. When Fabian was involved in humanitarian work while in the Amazon, he was blessed to have been shown the healing properties of the Rahua (ra-wa) nut by women from the Quechua-Shuar tribe. Editorial Stylist Mordechai Alvow founded YAROK and traditional recipes of nutrient-rich base and essential oils have been tweaked to formulate his hair care products which contain a blend of organic, all natural and wildcrafted botanicals that have been responsibly harvested. The YAROK hair care ingredients were made with vegan’s in mind and is free of alcohol, parabens and sulfates. All products are created in small batches to keep and preserve their freshness. Animals have been spared from testing. Now that speaks volumes! 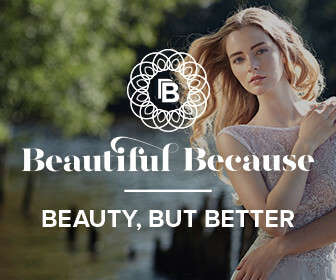 beautifulbecause.com.au – Australia and International Shipping. HUBALOU 100% Bamboo Wrap Hair Towels help to reduce drying time and minimize frizz. Hubalou’s founder Sarah, who is a mother of three, donates 10% of Hubalou’s profits to organisations who help to support basic human needs; such as food, shelter and clothing. Various colours available. Made in the U.S.A. Enjoy healthier, softer skin and less brittle hair by using the Enviro Shower Filter (by New Wave) which contains 16 ounces of bacteriostatic KDF-55 and 2 ounces of crystal quartz. The Enviro Shower Filter helps to reduce chlorine, hydrogen sulfide and heavy metals; naturally softening the water. Easy instructions. There’s no plumbing required! This is the exact same model that is installed in my bathroom. This will blow you away! A hair dryer that is Eco Friendly and one that I use at home. The Parlux 3800 Hair Dryer is built from recyclable materials and the packaging is made from 100% biodegradable recycled paper. Plastic combs, when used in the hair, cause static electricity and frizzing then create a huge problem when they end up in landfill. Switch to Carpenter Tan’s naturally dyed and undyed wooden hair combs. World’s first organic cotton hair ties by KOOSHOO. These fantastic hair ties, I know because I have some, have been dyed in the world’s ONLY 100% solar powered dye house right in downtown Los Angeles. KOOSHOO pack their products in 100% biodegradable shipping bags. Headbands are also available for men, women and babies .